Mechanisms involved in melanoma invasiveness and metastasis are essential to understanding the behavior of this aggressive melanocytic skin cancer. The epithelial-mesenchymal transition (EMT) is considered fundamental for overcoming the in situ stage of melanoma and its proliferation beyond the basal membrane. Matrix metalloproteinases (MMPs) and their tissue inhibitors (TIMPs) are key molecules involved in EMT about whose expression in lentigo maligna (LM) and lentigo maligna melanoma (LMM) little has been studied so far. In this article, our main aim was to review the role of TIMPs in invasiveness and aggressiveness of LM/LMM in order to detect EMT modifications in this type of melanoma. We also presented some partial personal unpublished results. It is well established by now that progression of melanoma depends on ECM remodeling, TIMPs family being one of the most important regulators of this process. Considering the multitude of molecules involved in cancer invasiveness and their complex interaction, it is too early to analyze and to conclude upon the significance of different expression of TIMPs in LM/LMM. We consider some correlations are needed to be done also with other consecrated histological (as Clark level, Breslow indexes, presence of ulceration, mitotic index, intratumor inflammatory infiltrate, etc.) and immunohistochemical markers [cadherins, vascular endothelial growth factor (VEGF), bcl-2, etc.] of prognosis and metastasis. In this light, we consider that our study could further clarify the significance of TIMPs expression in this specific type of melanoma. Liver damage is a serious medical problem worldwide and is caused by primary or secondary metabolic, microbiological, toxicological, immunological and circulatory etiological factors. The objective of this paper is to analyze the hepatoprotective effect of various plants, their biologically active compounds and extracts and the possibility of these compounds to attenuate complex pathophysiology processes during chronic inflammation and the development of liver cirrhosis. This review summarizes several plants whose hepatoprotective effects have been demonstrated and partially describes the mechanisms of inflammation inhibition. It is known that fibrosis includes an oxidative damage, inflammatory and immune response and star-shaped cells and their activation in hepatocytes. Effects of particular phytocompounds and their anti-inflammatory mechanisms have been studied in several cell lines in vitro, in vivo in different animal models, as well as in some clinical studies. Results suggest that mechanisms include reduction of oxidative stress, suppression of the inflammatory and immune response, as well as the inhibition of the activation of hepatic stellate cells (HSCs), decreasing extracellular matrix (ECM) deposition and induction of apoptosis, protection of hepatocytes from apoptosis and creating apoptotic bodies, which are phagocytic and activate HSCs. Medical herbs are abundant, economical and versatile and thus are potential alternative agents with anti-inflammatory mechanism. They can be a source of bioactive compounds, and with the aim of preventing the formation and progression of fibrosis, they can find wide applications in medical practice. The obtained results should promote further research in order to identify safe and effective protective and therapeutic resources. Autoimmune thyroiditis (AT) is a disease that may be associated with many other autoimmune endocrine and non-endocrine disorders. This disease is mediated by both humoral and cellular mechanisms and it is the result of combined effects of human leukocyte antigen (HLA) class II genes and non-HLA genes polymorphisms. The clinical course of AT is variable and may be characterized by spontaneous remission and by irreversible thyroid insufficiency as the consequence of atrophic and fibrous transformation of the thyroid gland in other cases. In this paper, the AT s etiology and immunological mechanism along with its cytological and histopathological features are reviewed in order to increase our understanding about the mechanism involved in pathogenesis of this disease and to open new directions of investigations that will be useful in a better clinical practice. Aim: The conjunctival nevus affecting children and adolescents is a rare condition and the literature showed only few reports on this issue. The aim of this article is to determine the histopathological features for the correct diagnosis of an inflammatory juvenile compound nevus of the conjunctiva (IJCNC) in order to make the difference between this tumor and other lesions, like conjunctival melanoma or lymphoma, very similar from a gross point of view. This article is a clinical pathological study of two cases of IJCNC with particular histopathological characteristics, who were admitted at the 2nd Ophthalmology Clinic, Prof. Dr. Nicolae Oblu Emergency Clinical Hospital, Iasi, Romania, over a period of five years (from July 1, 2012 to June 30, 2017). Both patients were adolescents, a boy (13-year-old) and a girl (12-year-old). Both lesions were bulbar juxtalimbal located and grew in size over one year. Seen at slit-lamp biomicroscopy, the first one presented as a non-pigmented lesion, while the second was a pigmented nevus, but their dimensions did not exceed 10 mm in diameter. From a histopathological point of view, both of them showed a nested junctional growth pattern, along with intra- and subepithelial location, of the nevomelanocytes. Tumoral cells demonstrated different degrees of atypical cytology, but in the second case, it was more obvious. Microscopic examination also revealed epithelial cystic inclusions, and prominent inflammation in the stroma of these two nevi. One of the cases presented heavy inflammation that took the form of lymphoid follicles and sheets of eosinophils, but the other showed only diffuse inflammation with lymphocytes plasma cells, and eosinophils within its stroma. The immunohistochemical characterization (anti-melan A, anti-S100 protein and anti-cytokeratin AE1/AE3 antibodies) of the tumoral cells helped to the diagnosis. Conclusions: IJCNC represent a small group of nevi that develop in adolescents and have some particular histopathological features. The pathological diagnosis is difficult as the microscopic features are very similar to a conjunctival melanoma, but a detailed microscopic examination, immunohistochemical stainings and the young age of the patient could help in establishing the benign nature of these lesions. Telocytes (TCs) are stromal cells with characteristic long, thin and moniliform prolongations termed telopodes. They were formerly termed interstitial Cajal-like cells. A characteristic set of markers to identify TCs in light microscopy has not been established until now. Transmission electron microscopy (TEM) is a better tool for identifying TCs. Telocytes display caveolae and can express caveolin-1. On the other hand, endothelial cells (ECs) as well as endothelial progenitor cells (EPCs) have caveolae. Recent evidence suggests that a subset of TCs are in fact EPCs. The distinction of this progenitor subset of TCs can be easily made by a specific set of ultrastructure markers, as follows. Caveolae of endothelial cells present stomatal diaphragms (SDs). The plasmalemma vesicle-associated protein-1 (PV-1), which is identical with the Pathologische Anatomie Leiden endothelium (PAL-E), is specifically identifying the ECs SDs of caveolae. We therefore raise the reasonable hypothesis that the EPCs subset of caveolae-presenting TCs could be accurately identified, without exploration in TEM, by the positive expression of PV-1 or PAL-E in the SDs. Adult granulosa cell tumors (AGCTs) have a heterogeneous morphology and an unpredictable behavior, which can lead to a misinterpreted diagnosis. The aim of our study was to assess the immunoexpression of estrogen receptor (ER) alpha, Ki67, calretinin, and inhibin A in AGCTs, in order to evaluate their value in diagnosis and prognosis of this type of tumor. Immunohistochemical stainings for these markers were performed in 21 cases of AGCTs. The immunopositivity evaluation of calretinin and inhibin A was scored according to the percentage of staining intensity and the extent of positive cells, of ER alpha was scored based on the percentage of positive cells, and Ki67 score was recorded as the percentage of positively stained nuclei across the tumor, without taking in consideration the staining intensity. ER was positive in nine cases, Ki67 was expressed in 12 cases, calretinin showed positive immunoreactivity in 16 cases, and inhibin A was positive in 14 cases. Stromal cells presented also immunopositivity for inhibin A and calretinin in the negative cases. ER alpha and calretinin immunoexpression can help in identification of cell components of AGCT. Our results regarding Ki67 expression emphasize the potential utility of this marker in tumor behavior prediction. Inhibin A immunopositivity has an important value in AGCT diagnosis, in association to the other evaluated markers. Additional studies are needed to identify new specific and sensitive markers for AGCT or, at least, of a panel of markers which might contribute to a more accurate characterization of these tumors. E-cadherin, beta-catenin and Snail are important molecules involved in cellular adhesion and epithelial-mesenchymal transition. Loss of E-cadherin expression, nuclear relocation of beta-catenin and high expression of Snail are connected to tumor progression, rapid cell growth and metastasis. The aim of our study was to analyze the immunohistochemical expression of beta-catenin, E-cadherin and Snail, depending on clinico-morphological aspects of the laryngeal squamous cell carcinomas. Our results revealed variable E-cadherin, beta-catenin and Snail expression, depending on differentiation degree and tumor stage. These markers can be helpful in identifying the aggressive laryngeal squamous carcinomas. We approach the theme of modern treatment strategies, based on clinico-biological, pharmacogenetic, neuroimagistic, neuroendocrinological and psychological integrative correlations in the management of depressive and comorbid anxiety disorders. We target to evaluate the efficacy of the pharmacogenetic testing and the evolution, functioning of patients in correlation with specific neurobiological, neuroimagistic and neuroendocrinological markers. Our research was conducted between 2010-2016 on 80 children and adolescents with depressive and comorbid anxiety disorders - 40 children (G1 group), who benefited in choosing the pharmacotherapy from pharmacogenetic testing and 40 children without testing (G2 group). Also, the patients were evaluated through magnetic resonance (MR) spectroscopy at baseline and after pharmacotherapy. The efficacy of the chosen therapy in correlation with the pharmacogenetic testing was evaluated through the mean change in the CDRS (Children s Depression Rating Scale) total scores, in the CGI-S/I (Clinical Global Impression - Severity/Improvement), CGAS (Children s Global Assessment Scale) and through the change of the relevant neurobiological markers and MR spectroscopy metabolites. We evaluated the side effects through the PAERS (Pediatric Adverse Events Rating Scale)-Clinician. Our results show statistically significant differences of the clinical scores between the studied groups: for those subjects who benefited of pharmacogenetic testing, the CDRS, the global functioning scores prove a higher clinical improvement, a better compliance and lower PAERS side effects scores and also improvement concerning the MR spectroscopy dosed metabolites values. Our research was a proof sustaining the use of the pharmaco-genetic testing in clinical practice and the value of investigating relevant neurobiological, neuroimagistic and neuroendocrinological markers for a personalized therapy in depressive disorders. The extracellular matrix (ECM) remodeling represents the pathological substrate of dilated cardiomyopathy (DCM). In this study, we statistically analyzed the immunoexpression of collagen I and III, matrix metalloproteinase-1 (MMP-1) and its tissue inhibitor-1 (TIMP-1) in the myocardial tissue in 18 cases of DCM compared to a control group. We observed a significant increase in the immunoexpression of collagen I and III in patients with DCM and a significant reduction in the immunoexpression of MMP-1 compared with the control group. Also, the collagen I and TIMP-1 expression indicated a positive linear correlation and respectively a negative linear relationship with collagen III and MMP-1. The analyzed markers in this study can be used to quantify the degree of collagen sclerosis from the ECM of DCM. Background: Eosinophilic colitis (EC) is a rare and ill-defined entity with an unknown pathogenesis and an unsatisfactory treatment response. The standard histopathological criteria for EC diagnosis lack specificity and not all the cases fulfilling those criteria are considered clinically as EC and treated. The objective of this study is to refine diagnostic criteria for EC. Methods: Retrospective study of all the cases with a histopathological diagnosis of EC in Hospital Clinico San Carlos (Madrid, Spain) from 2006 to 2016. We have reviewed their clinical and pathological features and tried to define the features differentiating cases considered EC on clinical grounds. Results: We identified 106 EC cases. In 22 cases, a clinical EC diagnosis was established. Confirmed EC was associated with younger age, female gender, diarrhea, higher maximum number of eosinophils/HPF (high-power field), intraepithelial eosinophils, architectural distortion and absence of acute inflammation. We chose a cut-off point of 40 for both mean and maximum number of eosinophils/HPF. A mean number of eosinophils/HPF higher than 40 was related to architectural distortion, mucosal atrophy, signs of eosinophil activation and submucosal infiltration. Cases with a maximum number of eosinophils/HPF higher than 40 showed more architectural distortion, intraepithelial eosinophils, submucosal infiltration and lack of lymphoplasmacytic infiltration. Conclusions: Histopathological diagnosis of EC is not well correlated with clinical EC. An increase in specificity can be achieved by raising the cut-off point to 40 eosinophils/HPF and by combining mean and maximum number of eosinophils with other microscopic and clinical features suggestive of EC. The histopathological and immunohistochemical diagnosis of endometrial biopsies is used for estimating the risk of progression in endometrial hyperplastic lesions in carcinoma and for guiding the clinical management. The objective of this study was to evaluate the immunohistochemical expression of the estrogen receptor (ER) and progesterone receptor (PR), p14, p53, phosphatase and tensin homolog (PTEN), Ki67, in patients with endometrial hyperplasia (EH) with/without atypia versus endometrioid endometrial carcinoma type 1. After the histopathological determining of the lesion type at endometrial level, the cases were studied using immunohistochemical methods, namely by the use of an antibody panel. The immunohistochemical staining of PR was nuclearly and cytoplasmatically positive in EH with/without atypia and cytoplasmatically negative in endometrioid carcinoma, and in ER, the immunohistochemical staining was cytoplasmatically negative in the forms of EH without atypia and positive in various stages of intensity in the rest of the cases. The immunohistochemical staining of p14 was moderately expressed in the endometrioid carcinoma and negative in EH without atypia at nuclear level, and at cytoplasm level, it generally had a positive expression. In our study, the nuclear and cytoplasmic study of immunoxpression p53, both in hyperplastic lesions and in the endometroid endometrial carcinoma, was negative, similar to the immunohistochemical expression of PTEN. At nuclear level, the immunohistochemical staining of Ki67 was positive in EH with atypia and in endometrioid endometrial carcinoma, while at cytoplasm level, it was positive only in endometrioid endometrial carcinoma. The nuclear and cytoplasmic study of this immunohistochemical marker panel shows a different reactivity in EH with/without atypia and endometrioid endometrial carcinoma. In clinical practice and literature studies, the most common condition associated to streptococcal tonsillitis used to be acute rheumatic fever (ARF). Several publications in the late years report a more frequent and distinctive entity from ARF following beta-hemolytic group A streptococcus infection in patients with post-infectious arthritis, that do not fulfill the modified Jones criteria, the so-called post-streptococcal reactive arthritis (PSRA). A distinctive pattern of clinical framing and biological profile in patients with PSRA following streptococcal tonsillitis is described, with a non-migratory, additive, recent onset (7-10 days) arthritis that affects small and large joints as well, with a bimodal peak of incidence at 8-14 and 21-37 years of age, with variate response to non-steroidal anti-inflammatory drugs and has a tendency for recurrence and persistence. Sacroiliitis, although rare, is described in human leukocyte antigen (HLA)-B27 positive PSRA patients. The main objective of the current study was to evaluate various immunohistochemical patterns of streptococcal tonsillitis in patients with PSRA and find possible correlations with the clinical, biological and ultrasound profile. Helicobacter pylori (HP) infection is one of the most frequent bacterial infections in humans. The studies performed in the last 30 years showed that this bacterium is the main cause of chronic gastritis and the main etiological agent of peptic ulcer and gastric cancer. We investigated the prevalence of HP infection in a group of 1525 patients who addressed a gastroenterology medical center between 2010-2014, in Craiova, Romania, for dyspeptic symptoms. The patients underwent a clinical, endoscopic and serologic investigation for highlighting a possible HP infection. The age of the patients with gastric duodenal pathology varied between 16 and 87 years old. Of the 1525 patients, a number of 971 (63.67%) were diagnosed with HP infection, while the rest of 554 (36.33%) were not infected. The study on the distribution of gastric duodenal pathology and HP infection showed that the lesions of the upper digestive tract and HP infection emerged quite early, a number of 29 patients being aged less than 20 years old; among these, 21 (72.41%) patients were HP positive and only eight (27.59%) were HP negative. In the age group of 20-29 years old there were recorded 184 patients, of which 120 (65.22%) were HP positive and only 64 (34.78%) were HP negative. There may be observed that in the age group of 20-29 years old, both the patients with gastric duodenal pathology and the ones with HP infection increased six times in comparison to the first decade. Most cases were recorded in the patients aged between 50 and 69 years old. The two decades comprised a total number of 607 (39.8%) patients, of which 375 (61.78%) were HP positive and 232 (38.22%) were HP negative. By evaluating the distribution of HP infection according to the social environment, there was observed that there were no significant differences between the patients coming from the urban area and the ones from the rural area, as far as the HP infection was concerned. 14. Could oral cytomorphometry be of value in distinguishing diabetes mellitus? The present study refers to a quantitative, morphometric analysis of exfoliative cytology smears collected from diabetes mellitus (DM) patients, in order to distinguish subtle changes in cellular and nuclear parameters. The study was carried out on 30 adult subjects: a control group of 10 healthy subjects and a study group of 20 diabetic subjects (type 1 and type 2 DM). Another factor that was taken into consideration was the abundance of the microbial flora. The oral smears were stained using Hematoxylin and Eosin and several parameters were measured (nuclear diameter, perimeter and area, cell large diameter and area), and calculated: nuclear/cytoplasmic ratio and nuclear roundness factor. We found out that the cells collected from DM patients had higher values of the nuclear parameters (the nuclei were larger) and lower cell dimensions. The nuclear to cytoplasmic ratio was increased in these patients, but the nuclear roundness factor was closer to one in the study group. Also, an increased number of bacteria, often seen in DM patients, decreased the nuclear parameters. Our findings complete recently descriptive cytology studies with the morphological measurements in case of bacterial abundance and sustain the possible value as screening method for morphometry. Puromycin aminonucleoside (PA) has been generally utilized as model of podocyte injury followed by massive proteinuria, severe damage on endocytotic activity of epithelial cells and postmodification of endocytosed compounds. However, total PA nephrosis (PAN) mechanism cannot be understood. We aimed to study glomerular function, foot process degeneration and transport pathways of podocytes in pre-proteinuria and acute PAN rats. Eighteen male Wistar albino rats were divided into three groups: control, pre-proteinuria and acute nephrosis groups (n=6). PA was injected into pre-proteinuria group for three times and acute group for nine times. Proteinuria levels in urine, creatinine and albumin levels in blood were detected 24 hours after PA injections. Renal cortex samples were prepared for transmission electron microscopy. Proteinuria levels in acute group significantly elevated, whereas creatinine clearance, serum albumin levels and urine volumes diminished compared to control and pre-proteinuria groups. In pre-proteinuria group, hypertrophy and structurally rich cytoplasm were detected only within podocytes. Acute group had various protein absorption granules secreted from podocyte cytoplasm to the urinary space through exocytosis after lysosomal digestion; but not observed in pre-proteinuria group. The number of slit pores in pre-proteinuria group decreased, particularly related to fusion of foot processes, subsequently leading to proteinuria. We concluded that foot process fusion begins prior to development of proteinuria although their serum albumin and creatinine clearance levels do not differ significantly. Additionally, we suggested that in acute PAN, first affected glomerular cells could be podocytes and there could be a correlation between glomerular function and number of slit pores. In this paper, the complex 3D virtual model of the prosthetic knee is obtained using embedded applications: DesignModeler and SpaceClaim under ANSYS Workbench 14.5 software package. A number of six cases of prosthetic knee joint assembly, depending on the malalignment angle, are developed. Stress maps and the values of the maximum von Mises stress on the three prosthesis components: polyethylene insert, tibial component and femoral component, for all studied prosthetic knee assemblies were obtained. The results show that as the malalignment angle increases, the values of von Mises stresses increase in all prosthesis components. The parameterized virtual models of the knee prosthesis components allow different changes in shape or dimensions, which can lead to the optimization of the implant and to the improvement of the prosthetic knee biomechanics. Diffuse large B-cell lymphoma (DLBCL) is a heterogeneous group of lymphoid malignancies, which counts for more than a third of non-Hodgkin s lymphoma cases. The aim of the current study is to evaluate the prognostic role of several immunohistochemical (IHC) markers involved in the pathological process of DLBCL. This is a retrospective analysis of the 97 de novo DLBCL patients admitted between January 2007 and December 2016 in the Department of Hematology, Filantropia Municipal Hospital, Craiova, Romania. The expression of Bcl-2, Ki67, c-MYC and p53 was assessed by immunohistochemistry. A significant level of association was observed between high prognostic index values and Bcl-2, Ki67, c-MYC and p53 positive cases. Moreover, overall survival and disease-free survival were higher in patients with negative expression for these markers. Bcl-2, Ki67, c-MYC and p53 could make important diagnostic and therapeutic targets; therefore, their routine assessment should be mandatory. The diagnosis of Krukenberg tumors, as in other types of metastatic tumors of unknown primary origin, can often be a challenge for clinicians. In many cases, traditional diagnostic methods are insufficient, requiring immunohistochemistry analysis for identifying the origin of metastatic tumors. In our study, we examined a total of 34 female patients with Krukenberg tumors with different sites of the primary tumor: gastric (n=18), colorectal (n=6) or breast (n=7) and tumors with unknown origin (n=3). Cytokeratin (CK) 7 and CK20, carcinoembryonic antigen (CEA) and cancer antigen (CA) 125 were applied. The analysis of immunohistochemical profiles for CEA and CA125 showed that, regardless of the histological origin, the predominant immunohistochemical profile was CEA(+)/CA125(-). CK7/CK20 profile was different depending on the histological origin of the Krukenberg tumors. Thus, for the cases of gastric origin, CK7(-)/CK20(-) was present in 66.7% (12/18) of the cases. For the cases with colorectal origin, the predominant immunohistochemical profile was CK7(-)/CK20(+), in a percentage of 66.7% (4/6). The combination CK7(+)/CK20(-) was found in 85.7% (6/7) among cases of breast origin. Consequently, the immunohistochemical profile CK7/CK20 can have a key role in identifying the primary tumor in patients with Krukenberg tumors of unknown origin. Moebius syndrome, also called congenital facial paralysis is a rare neurological disease, whose etiology is not fully elucidated. It affects especially facial and oculomotor cranial nerves and its clinical feature is peripheral facial paralysis. The objective of the study is to highlight the anatomical and functional changes in the Moebius syndrome and establish certain criteria that should be the basis for reparative surgery in this disease. For this purpose, we used a group of six patients diagnosed with this pathology, in whom we pursued functional anatomical and histological changes of the superficial layers of the face that we have grouped in terms of their clinical impact. All the data obtained were centralized in order to assess anatomical functional changes occurring after evolution in time of lesions caused by Moebius syndrome. The results of the study led us to conclude that the face is made up of three main regions - median, medial and lateral -, which behave differently both in atresia of the facial nerve and in healthy individuals. This has an important echo on the way we emphasized the functional anatomy of superficial layers of the face and in surgery. Insulin-like growth factor (IGF) family is made up of two polypeptides, IGF-I and IGF-II, six specific binding proteins (IGFBPs 1-6) and specific receptors. IGF-I is involved in the regulation of growth and cellular proliferation and has a similar structure to insulin. The major IGF transport function is attributed to IGFBP-3. Some studies have highlighted the association between IGF and diabetes. The aims of this study were to analyze the correlation between IGF with glycemic control, glomerular filtration rate (GFR), blood pressure, hematological changes or body mass index (BMI) in patients with type 2 diabetes mellitus (T2DM). Thirty patients with T2DM and thirty non-diabetic control patients were included in this study. Clinical, anthropometric, biochemical parameters and morphology of blood smear were recorded. Blood pressure was determined by mercury sphygmomanometer. The anthropometric measurement included BMI. The biochemical parameters included fasting plasma glucose (FPG), glycated hemoglobin (HbA1c), GFR, serum IGF-I, IGFBP-3 levels. The IGF-I/IGFBP-3 ratio was evaluated. The plasma glucose was determined enzymatically, HbA1c was determined by high-performance liquid chromatography (HPLC) and GFR was calculated automatically. IGF-I was measured by immunoradiometric assay (ELISA - enzyme-linked immunosorbent assay) and IGFBP-3 by sensitivity immunoassay. For the analysis of the morphology of blood smear, May-Grunwald-Giemsa (MGG) was used as staining technique. The microscopic examination was performed initially with the objectives of 10x/20x and subsequently with an immersion objective of 100x. Image acquisition was done after the examination of the preparations obtained with a 40x objective, using Image Pro Plus 6.0 software. In the present study, we observed that T2DM leads to an increase in the IGF-I and IGFBP-3 levels. No relationship was obtain between IGF-I, IGFBP-3 levels and IGF-I/IGFBP-3 ratio with neither parameters studied. The difference of serum IGF-I and IGFBP-3 levels between patients with T2DM and subjects without diabetes showed that IGF-I may be a useful marker for diabetes mellitus and IGFBP-3 for possible complications of this affection. Transcription factors play a central role in the epithelial-mesenchymal transition (EMT), which is one of the biomolecular mechanisms involved in the progression of urothelial carcinomas of the bladder (UCB). In this study, we analyzed the immunoexpression of Twist 1, Snail, Slug and beta-catenin in relation to histopathological prognostic parameters of UCB. The obtained results indicated the association of Snail and beta-catenin expression with low grade and early stage of UCB, as well as the association of Twist 1 and Slug expression with high grade and advanced stage lesions. The specific or sequential action of transcription factors in the bladder tumoral EMT may be useful for identifying the aggressive lesions. We assessed the veins histopathological characteristics and preexisting medical conditions before arteriovenous fistula (AVF) creation, and their correlation with AVF outcome and primary patency in patients with end-stage renal disease (ESRD). In this observational, prospective, mono-center study in Romania, patients with artery and venous diameters >=2 mm and >=2.5 mm, respectively, were enrolled. Vein specimens were harvested at AVF creation and evaluated by Hematoxylin and Eosin, Masson s trichrome and Orcein stainings, in terms of intimal hyperplasia, elastic fibers disposition, medial hypertrophy and smooth muscle cell disorganization and fibrosis (graded from mild to severe). Venous diameters and blood flow one/two-months post-AVF creation, AVF maturation at dialysis start, two-year primary patency were assessed. Of 115 examined patients, 50 were enrolled and underwent AVF creation. Of six (12%) patients with no vein morphological changes, 11 (22%) with mild histopathological changes, 19 (38%) with moderate and 14 (28%) with severe histopathological changes, four (67%), eight (73%), 17 (89%) and 12 (86%), respectively, had mature AVF. Regardless of histopathological characteristics, non-mature AVF were recorded in older patients and with smaller venous diameter. One/two-months post-AVF creation, in all patients with mature AVF, venous diameter and ultrasonographic blood flow were similar. Two years post-AVF creation, 26 patients had functional AVF; non-functional AVFs were recorded more likely in women and functional AVFs were most likely located on forearm. The veins histopathological modifications may not negatively influence AVF maturation in ESRD patients. AVF maturation failure may most likely be related to age and venous diameter at AVF creation. Introduction: The aim of this study is to assess the osseointegration of different dental implants surfaces in diabetic rats. Materials and Methods: In this study, were used 56 male Wistar rats, average weight of 300-350 g. Diabetes was induced by a single intraperitoneal injection of Streptozotocin. The glucose levels and weight of rats were periodically evaluated. After the diabetes mellitus is confirmed, the sandblasted, large-grit, acid-etched (SLA) and SLActive endosseous dental implants (TAG dental implants, TAG Medical, Israel), made of titanium alloy, Ti-6Al-4V, 1 mm diameter and 3 mm in length were inserted in the distal metaphysis of the left femur. Results: Diabetic rats have naturally lower number of bone cells and bone-implant contact (BIC%) than healthy rats when using the SLA implant, but when using SLActive implant, diabetic and healthy rats have the same numbers. Conclusions: The use of the SLActive surface resulted in positive effects in healthy and especially in diabetic animals, which demonstrate that could improve the osseointegration progress in humans with diabetes. 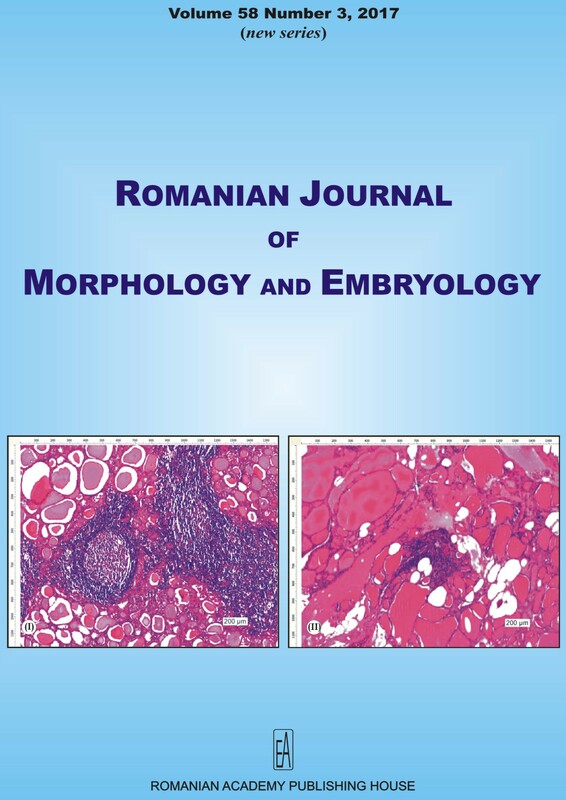 Aim: The authors made a morphological assessment of musculoskeletal tissue samples from patients admitted in Surgical Departments of the Emergency County Hospital of Craiova, Romania, between 1990 and 2015, proved as presenting tuberculous lesions in the Department of Pathology of the same Hospital. Materials and Methods: The studied material consisted of bone, joint and sometimes muscle tissue fragments resulted from biopsies or surgical excisions from 54 cases coming out of 841 patients investigated in the above-mentioned period of time, where the established histological diagnosis was tuberculosis (TB). For diagnostic confirmation, Ziehl-Neelsen staining has been used as a rule but, in some cases, immunohistochemistry was also used. Results: TB lesions have prevailed in men and around the age of 50 despite the tissue involved (either bones or joints or both structures). Bone tissue, lower limb and right side of the body have been more frequently touched by the TB lesions. Axial bones (spine, ribs and hip bone) and knee joint have been the favorite sites. From morphological point of view, the inflammatory cellular population has been dominated by the epithelioid and giant Langhans cells that surrounded areas less or more extended of classical acidophilic fine granular necrosis. The fibrosis was observed more frequently around bone lesions, usually in an incipient phase. Overall, the granulomatous reaction was of reactive type but one should notice hyporeactive or areactive, disorganized reaction encountered quite often in bone or associated bone and joints lesions. Conclusions: Osteoarticular tuberculosis (OATB) has a complex and dynamic clinical morphological picture, which is still partly known, described and understood especially in the field of morphological changes. Further detailed and integrative analysis of both clinical and morphological aspects is required so the suspicion of diagnosis at the admission becomes as soon as possible certitude. Lower respiratory tract infections (LRTIs) is an umbrella term that covers a wide spectrum of diseases, comprising mild and severe, acute and chronic conditions. A wide spectrum of pathogens can be implicated, from viruses to pyogenic and atypical bacteria. A special place should be reserved for slow growing bacteria (Mycobacteria spp., Nocardia spp.) and parasites (i.e., hydatic cysts caused by Echinococcus granulosus). Objective: The objective of this study is to observe, analyze and establish the drug susceptibility patterns for Enterococcus spp., Staphylococcus aureus, Klebsiella spp., Acinetobacter baumannii, Pseudomonas aeruginosa, Enterobacter spp. (the ESKAPE pathogens) in the Marius Nasta Institute for Pulmonary Medicine (MNIPM), Bucharest, Romania. Materials and Methods: A retrospective healthcare record based study was undertaken to establish the drug susceptibility patterns. We assessed all antibiograms of the ESKAPE pathogens isolated from respiratory samples from adult inpatients hospitalized between 2010-2015 at the MNIPM. Results: We analyzed 2859 isolates (61% of the 4683 ESKAPE isolates). P. aeruginosa was the most frequent pathogen, while Enterococcus spp. and Enterobacter spp. were practically non-present. The antibiotic profile of P. aeruginosa isolates presented more resistance in the Intensive Care Unit (ICU)/Surgery wards, probably resulting from antibiotic pressure. The other non-fermenter, A. baumannii, while less frequent (and the only pathogen more frequent in the surgery department) had an even more resistant profile, to almost all antibiotics, with the exception of Colistin. Methicillin-resistant S. aureus (MRSA) accounted for about 60% of all isolates, more in the ICU/Surgery ward. K. pneumoniae presents a less resistance and shows more stability when analyzing the antibiogram pattern in the Medical wards. Discussion: For methodological or procedural reasons, Enterococcus spp. and Enterobacter spp. were underrepresented in the study. Interventional programs comprising antibiotic stewardship and active surveillance need to be implemented to alleviate the antibiotic profile. Further research needs to focus on more detailed characterization of the molecular mechanisms leading to the high resistance detailed herein. Conclusions: This study adds to the body of literature reporting the antibiotic resistance landscape in Romania, for these highly resistant pathogens. Morbid obesity is a metabolic disease characterized by an excessive accumulation of adipose tissue (>=40%). This disorder is commonly associated with cardiovascular disease, arteriosclerosis, type 2 diabetes, hypothyroidism and some types of cancer. The most common metabolic signals associated with the disease are leptin, ghrelin, with antagonic effects. Our study aimed at highlighting leptin and ghrelin expression levels, as well as establishing correlations between them and clinical-biological parameters in obese patients. The biological material was taken intraoperatively from the visceral adipose tissue. Expression of genes of interest was performed after total RNA extraction and reverse transcription-polymerase chain reaction (RT-PCR) and amplification with TaqMan specific primers. The results of the study showed significant differences in the expression of leptin mRNA between obese patients and the control group as well as the gender of the subjects. Ghrelin levels correlated positively with obesity, but not with gender. There were no significant correlations between the expression of the genes of interest and the parameters studied (age, body mass index - BMI, cholesterol, triglycerides, glycemia, diabetes, hypothyroidism and hypertension). The results of the study suggest that the evaluation of leptin levels can be used clinically in assessing the metabolic status of the patient with malignant obesity. The paper analyses results of serum cytokines and lymphocyte apoptosis study in patients with nodular goiter against the background of autoimmune thyroiditis (NGAIT) and thyroid adenoma (TA) based on the cell preparedness to apoptosis (content of lymphocytes carrying apoptosis marker - CD95+-receptor), the number of apoptotic lymphocytes (annexin V+-lymphocytes) and the content of proapoptotic tumor necrosis factor-alpha (TNF-alpha), interleukin (IL)-1beta and IL-6, as well as anti-inflammatory IL-4 cytokine in serum, considering the polymorphism of BCL-2 (rs17759659), CTLA-4 (rs231775) and APO-1/FAS (rs2234767) genes. The results show that under the damaging action of peroxidation products in the thyroid structures, activation of Fas- and caspase-dependent mechanisms of influence on pro- and anti-apoptotic targets, the induced hyperproduction and release of TNF-alpha from thyroid-stimulated lymphocytes stimulate an additional synthesis of other pro-inflammatory cytokines IL-1beta and IL-6, as well as compensatory anti-inflammatory proteins including IL-4. There is a synchronized increase in secretion of the soluble form of TNF-alpha receptor (sTNFR), which prevents binding the corresponding cytokine to a specific membranous shedding of a number of receptors and separates the apoptotic signals. The above-mentioned changes associate with the polymorphic variants of BCL-2 (rs17759659), CTLA-4 (rs231775) genes and only for some figures, they are almost three times weaker with FAS (rs2234767). In this work, several nanostructures (nanopowders and nanostars) of undoped and 1%, 3% and 5% europium (Eu3+)-doped ZnO have been synthesized via coprecipitation method using oxalic acid and sodium hydroxide as precipitation agents. Starting from zinc acetate and europium acetate, nanopowders were obtained by coprecipitation with oxalic acid. ZnO based nanostars were synthesized by coprecipitation of Zn2+ and Eu3+ with hydroxide ions (HO-), when zinc chloride and europium acetate were used as reagents. The structure and morphology of the as-prepared ZnO nanopowders and nanostars were investigated by X-ray diffraction and electron microscopy. Only wurtzite structure of ZnO was identified in all the samples based on ZnO. Transmission electron microscopy (TEM) investigations have shown an average particle/crystallite size range from 23 to 29 nm and polyhedral and spherical morphology with tendency to form aggregates for nanopowders. Cytotoxicity tests on MG-63 cell lines was also performed. Photocatalytic activity of ZnO nanopowders have reached higher values compared to ZnO nanostars. The photocatalytic test indicates that the ZnO nanopowders have better activity than the nanostars, most probably because of the higher specific surface. Doping the ZnO with Eu2O3 does not seem to alter it in a decisive manner. The toxicity results indicated that ZnO nanoparticles (NPs) high toxicity on tumoral cells is also induced by particle size and, consequently, the dissolution of Zn2+ ions is dependent on the size of the particles, increasing with the particles size. Oxidative stress is a culprit responsible for the development of acute and chronic kidney diseases. We aimed to establish a working model for the dynamic in vivo assessment of reactive oxygen species (ROS) production in rat kidney. A randomized controlled study was performed in 36 adult male Wistar rats subjected to unilateral urinary obstruction (UUO) via ureteral ligation and compared to SHAM controls. Dihydroethidium (DHE) was injected in the femoral vein and in vivo confocal microscopy was performed in the 2nd, 6th and 10th day, respectively after surgery. Maximal ROS levels elicited by UUO were recorded on the 6th day. However, the absolute difference of the means of DHE fluorescence intensity between UUO and SHAM was the highest on the 10th day. Our working model can monitor ROS production at different time frames and our initial findings suggest that the surgery-related ROS levels decline after an initial increase in the first days, whereas the ones elicited by chronic ligation continue to raise. Mast cells (MCs) are important object in experimental acupuncture due to their putative involvement in local reactions to needling. In the rat, they are shown to contain in their granules, among other tissue mediators, serotonin, also called 5-hydroxytryptamine (5-HT). The aim of this study is to examine the normal distribution of 5-HT-containing MCs in soft tissues of Zusanli (ST36) acupuncture point (acupoint) and their morphological changes caused by experimental acupuncture. We observed 5-HT-immunopositive MCs in the tissues and in the vicinity of the needle tract formed after acupuncture. As a result of acupuncture needling, the tissue integrity is disrupted and certain folds are formed in the direction of the needle tract. Connective tissue in the vicinity of the needle tract gets compressed and displaced, together with the 5-HT-immunoreactive MCs seen there. Some of those 5-HT-immunopositive MCs showed signs of degranulation with numerous discharged granules, some of them found at a considerable distance form the cell. Furthermore, 5-HT-immunopositive MCs are unevenly distributed in soft tissues of ST36 acupoint. Larger numbers of 5-HT-containing MCs were visualized in subcutis and dermis, compared to the observed in striated muscles. Placing the acupuncture needle into the rat skin caused a formation of an apparent needle tract, tissue displacement and degranulation of 5-HT-immunopositive MCs. The demonstrated serotonin release by means of MC degranulation might be involved in the local tissue response to acupuncture. The routine dissection of a male body revealed multiple anatomical variations of the celiac trunk and hepatic artery vascularization. The origin of the celiac trunk was on the left side of the abdominal aorta, next to the T12-L1 intervertebral disk. The celiac trunk gave off five branches: the left inferior phrenic artery, the left gastric artery, the accessory right hepatic artery, the common hepatic artery and the splenic artery (the last two arteries had a common origin in a hepatosplenic trunk). A right branch detached off the left gastric artery and anastomosed with the hepatic artery proper. The proper hepatic artery also anastomosed with the accessory right hepatic artery at the same level. Consequently, the entire hepatic arterial supply was from the celiac trunk - through two arteries directly and a third via the left gastric artery. The anatomical variant described in this case can be considered very rare. Thorough knowledge of such variants is important both for upper abdominal surgery and for imagistic and interventional radiology. Malignant cutaneous mixed tumor (CMT) is a very rare adnexal tumor with biphasic differentiation. In rare cases, a benign CMT (chondroid syringoma) undergoes malignant transformation. Sebaceous differentiation in a cutaneous malignant mixed tumor has not been previously reported. We present a malignant CMT with sebaceous differentiation, which occurred on the scalp of an 81-year-old man. The tumor showed epithelial elements composed of relatively small and bland-appearing ductal and cord-like structures lined by small, cuboidal-shaped adnexal cells, with a few large, dilated gland-like spaces lined by larger, apocrine-appearing cells with abundant eosinophilic-staining cytoplasm. However, the majority of the epithelial component was composed of nests and islands of markedly enlarged and atypical cells with pale/clear to ground-glass cytoplasm. Focally, there was sebaceous differentiation identified, in the form of prominent multivacuolated cytoplasm, with nuclear indentations. The stroma showed a mixture of myxoid and hyalinized/chondroid-appearing areas with focal calcifications. There was strong and diffuse staining of the sebaceous cells by cytokeratin (CK) 7, epithelial membrane antigen (EMA), and androgen receptor (AR). Mismatch repair proteins were investigated by immunohistochemistry, without evidence of loss of expression of MutS protein homolog 6 (MSH6), MutS protein homolog 2 (MSH2), MutL protein homolog 1 (MLH1), or postmeiotic segregation increased 2 (PMS2) in the sebaceous cells. Meningiomas are among the most commonly encountered tumors of the central nervous system, being more frequent in females. We present the case of a dyslipidemic male patient, previously diagnosed with coronary artery disease for which he previously underwent percutaneous coronary intervention with the placement of two bare metal stents on the left anterior descending artery. He was presented to the emergency department for atypical angina and a seven-day history of dizziness when switching from clino- to orthostatism, reduced visual acuity, diplopia and vomiting. Electrocardiogram (ECG), both at rest and exercise test were suggestive for myocardial ischemia. Echocardiography revealed myocardial hypokinesia in the territory of the right coronary artery and of the left descending artery, while coronarography showed insignificant intra-stent stenosis. Imaging techniques revealed a frontobasal extraneuraxial mass, creating a compressive effect on both middle cerebral arteries and on the optic chiasm as well as thickening of the dura mater adjacent to the mass. Endocrinology blood tests showed hypocortisolemia, hyperprolactinemia and low levels of free thyroxine (fT4), suggesting secondary combined pituitary hormone deficiency. The patient underwent surgery and total resection of the tumor was performed. Definite diagnosis - transitional meningioma - was obtained through histological examination and immunohistochemistry. The key feature of this case was the extra-cardiac cause of angina accompanied by ECG abnormalities in a patient with stable coronary heart disease, in whom the clinical presentation was secondary to blood pressure variations in the context of pituitary and adrenal deficiency. Borderline tumors have a histological aspect of atypical epithelial proliferation without stromal invasion and typically occur in fertile ages, approximately one-third of women diagnosed are younger than 40. Serous borderline tumors are the most encountered and they can present micropapillary features that are associated with a higher rate of recurrence and the possibility of peritoneal implants. We present the case of a serous borderline ovarian tumor in a young patient and the diagnosis and treatment particularities. The patient presented with no symptoms, for a specialist advice, in the context of failure obtaining spontaneous pregnancy over a period of seven months. Paraclinical, the only modified parameter was CA 125, respectively a slight increase of its value. The atypical appearance on abdominal and transvaginal ultrasound indicated a presumptive diagnosis; both ovaries with multiple irregular vegetation, moderately vascular on Doppler examination, with the starting point in epithelial capsule shell, that appeared thick and hyperechogenic. About 7 cm of pelvic fluid was also present. During exploratory laparoscopic intervention, the surrounding tissue of both ovaries was biopsied and the fragments were sent for histopathological and immunohistochemical exam. Immunohistochemical assays correlated with the histopathological analysis and anatomical clinical data confirmed the diagnosis. After informed consent, the patient underwent radical surgery with a quick and uneventful recovery. The series of investigations had the objective to establish the best management of the case and reviewing the possibility of a conservative surgery. Patient clinical aspect matched with the patterns of ovarian borderline tumors by the asymptomatic presence of the bilateral adnexal masses. Ameloblastoma is an aggressive odontogenic tumor, which arises from odontogenic epithelium. Ameloblastomas can present in several clinical and histomorphological patterns. The granular cell variant accounts for only 3.5% to 5% of ameloblastomas. We have presented two cases of granular cell ameloblastoma (GCA) occurring in a 44-year-old and 50-year-old man, respectively. Case No. 1 on incisional biopsy was diagnosed as unicystic ameloblastoma (UA), which later after excisional biopsy was finally diagnosed as GCA owing to the features observed in excisional biopsied tissue. Case No. 2 on incisional biopsy showed darker and lighter stained cells arranged in small follicular pattern, and anastomosing cords. Meticulous immunohistochemistry, histochemical examination and careful literature search helped us to diagnose it as GCA. We have made an attempt to elucidate the diagnosis of GCA especially in cases of GCA with unusual granular component. Salivary gland tumors have a high incidence (90%) within the parotid gland. The acinic cell carcinoma (ACC) represents only 1-3% of the salivary gland tumors, most frequently affecting the parotid. The minor salivary glands rarely develop ACC and when the ACC is localized in these glands, generally, it has a less aggressive evolution. The main criterion in the diagnostic of ACC is the histological examination with the regular Hematoxylin-Eosin (HE) staining and additionally Periodic Acid-Schiff (PAS) special staining. Immunohistochemical (IHC) examination confirms the origin of the tumor cells and the cellular proliferation index. Therapeutic management consists of surgical excision and radiotherapy. Left jugular tumor was the clinical diagnosis in the case we presented. The computed tomography (CT) examination revealed a voluminous expansive process of the left cheek. Surgery was performed with tumor resection and the skin defect was threatened. The histopathological (HP) and IHC exams have established the diagnosis of minor salivary glands adenocarcinoma with increased tumor proliferation index. The evolution was unfavorable to tumor recurrence in a short time of one year. Extramammary Paget s disease (EMPD) is an uncommon intraepithelial carcinoma usually found as an irregular, pruritic plaque on the apocrine-rich anogenital skin. Diagnosis of EMPD is challenging due to the rarity of the disease and the uncharacteristic clinical aspect and requires histopathological confirmation. We report the case of a 62-year-old human immunodeficiency virus (HIV)-positive male, which presents with a lesion of the left part of pubic area with clinical and dermatoscopic appearance suggestive for Bowen s disease but with histopathological diagnosis of EMPD. We present pathological and immunohistochemical data to confirm the diagnosis. Introduction: Uterine leiomyosarcoma (ULMS) is a rare tumor, representing 1-2% of all uterine malignancies. It is highly aggressive, with high metastatic rate, especially in lungs, peritoneal cavity, retroperitoneum, bones and liver, usually during the first years after diagnosis. Case presentation: A 58-year-old woman, with subtotal hysterectomy and bilateral adnexectomy, followed by radiochemotherapy for spindle-type ULMS nine years ago, presented with gastrointestinal bleeding and severe anemia. Three polyps ranging from 2 cm to 5 cm in diameter were found at gastroscopy, the largest being ulcerated, which required a total gastrectomy three months later. Colonoscopy identified two pedunculated polyps on the descending colon, 2 cm and 3.5 cm in diameter. Histologically, both sites revealed proliferations of spindle cells with whorled pattern, moderate to severe nuclear atypia, 5 to 8 mitotic figures (MFs)/10 high-power fields (HPFs) and additional necrosis in the gastric tumors. Immunohistochemistry was negative for CD117, DOG1, S100 and CD34 and positive for smooth muscle actin (SMA), estrogen receptor (ER) and progesterone receptor (PR). Twenty percent of nuclei stained positive for Ki67. The diagnosis was synchronous hemorrhagic gastric and colonic polypoid metastases of ULMS. Thoracic computed tomography (CT) and abdominal ultrasonography were negative for other metastatic lesions, while abdominal CT revealed abdominal and pelvic lymphadenopathy. Conclusions: This case illustrates a distinct pattern of metastasis that is an extremely rare gastric and colonic location and an expanded disease-free period of nine years since the initial treatment. A long-term clinical and imaging follow-up of this patient is essential. Meckel-Gruber syndrome (MKS) is a lethal, autosomal recessive transmitted anomaly, characterized by the ultrasound triad: occipital meningoencephalocele, bilateral polycystic kidney, postaxial polydactyly. The incidence is between 1/13 250 and 1/140 000 live births, being a rare anomaly. We report a MKS case of feminine gender diagnosed on two ultrasound findings (bilateral polycystic kidney, occipital meningoencephalocele). This case highlights the presence of MKS in a young female without family history. Stenting of aortic coarctation became the method of choice. In severe aortic coarctation, when retrograde crossing of the coarctation is impossible, a secondary approach with antegrade arterial crossing proved to be the solution in many cases. Here we report two cases of severe aortic coarctation in males aged 12 and 14, respectively, in which we used a secondary transradial approach (right and left) followed by guidewire snaring. For the first case, a right radial-right femoral arterio-arterial circuit was created, which offered a stable position during stent implantation. In both cases, we predilated the lesion and then implanted a 45 mm Cheatham-platinum (CP) covered stent. The final result was very good in both patients; only the first one required post-dilatation of both ends of the stent. Asymptomatic post-procedural absence of left radial pulse was noticed in the second case. In conclusion, even in the case of children, secondary transradial approach is suitable for antegrade crossing of the coarctation in extremely severe cases and possibly in stabilization of the circuit for stent implantation. Strumal carcinoid represents a rare form of ovarian teratoma, consisting of both thyroid tissue and carcinoid structures. The carcinoid component is a well-differentiated neuroendocrine tumor with excellent prognosis. Strumal carcinoid tumors are commonly found in peri-menopausal women who are not usually interested in preserving their fertility and who are thus open to radical surgical treatment. In this report, we present a 24-year-old, nulliparous patient with strumal carcinoid, confirmed by histopathology and a large panel of immunohistochemistry (IHC) markers, who wished to preserve her fertility. In this case, a conservative surgical treatment (salpingo-oophorectomy) served to preserve vital and reproductive prognosis, and correct tumor classification was of extreme importance. The morphological examination of strumal carcinoid showed struma ovarii with a thyroid follicle-like structure [positive for thyroid transcription factor 1 (TTF1), thyroglobulin, CD56, cytokeratin (CK) 19, and negative for Hector Battifora and mesothelioma 1 (HBME1)], and a neuroendocrine cell component with a trabecular arrangement and island growth (positive for synaptophysin, chromogranin, CD56, and CK7 negative), which were interlocked and intimately associated. Papillary thyroid carcinoma of follicular type was ruled out by CD56 positivity and HBME1 negativity. Medullary thyroid carcinoma with strumal component was excluded by calcitonin negative staining. Solid rosette-like structures with negative glial fibrillary acidic protein (GFAP) staining ruled out a neuroectodermal component. A multilocular mucinous cystadenoma was identified without other teratoma components. Strumal carcinoid requires a meticulous examination to rule out other entities with malignant behavior and poor prognosis. In this case, a conservative treatment is sufficient to remove the tumor, preserving vital and reproductive prognosis. Post-transplant lymphoproliferative disorder (PTLD) is defined as a heterogeneous group of lymphoid and plasmocytic proliferations with variable malignant potential. They often arise in immunocompromised post solid organ transplant (SOT) patients linked with Epstein-Barr virus (EBV) infection. Clinical manifestations include fever, lymphadenopathy and organ involvement. Diagnosis of PTLD requires morphopathological tissue examination. Treatment of EBV-related PTLD in SOT patients includes immunosuppressive (IS) agents reduction, use of antiviral medication, anti-B-lymphocyte antibodies and chemotherapy for high-risk patients. We report a case of late EBV-related PTLD occurring in a young female, coming from twins, nine years after renal transplant from deceased donor. Both sisters were diagnosed at the age of 10 with chronic kidney disease (CKD) based on nephronophthisis and underwent the first simultaneous renal transplant from deceased donor in Romania. PTLD Hodgkin s-like lymphoma and EBV-positive lesions were to be found in autopsy. Routine EBV viral load testing and immune condition in SOT patients could identify PTLD risk factors therefore early treatment can be applied. Monitoring EBV serology and immunological parameters are preferred as strategy for PTLD prevention. Langerhans cell histiocytosis (LCH) is a rare disorder caused by monoclonal Langerhans cells proliferation in bone, skin, lung, lymph nodes, liver, spleen, nervous or hematopoietic system. Pulmonary LCH is a diagnostic trap that is displayed on computed tomography (CT) as an interstitial disorder with honeycomb aspect. In this paper, we present an unusual case of a 26-year-old female that was hospitalized with progressive worsening dyspnea and history of recurrent pneumonia. Lung biopsy showed fibrosis of the interalveolar septa, architectural distortion and large cells with foamy cytoplasm and convoluted nuclei that were marked by CD68, S-100 and the specific antibody CD1a that allowed establishing the diagnosis of pulmonary LCH. The only extrapulmonary manifestations were femoral bone cysts that were radiologically seen 10 years before and were not modified along the years. The therapy consisted on smoking cessation and oral corticosteroids without significant improvement of the clinical symptoms and enlargement of the cystic spaces during six months of follow-up. This case highlights for a rare disorder of the lung that should be taken into account in young patients with progressive pulmonary fibrosis. Dandy-Walker complex (DWC) is a malformative association of the central nervous system. DWC includes four different types: Dandy-Walker malformation (vermis agenesis or hypoplasia, cystic dilatation of the fourth ventricle and a large posterior fossa); Dandy-Walker variant (vermis hypoplasia, cystic dilatation of the fourth ventricle, normal posterior fossa); mega cysterna magna (large posterior fossa, normal vermis and fourth ventricle) and posterior fossa arachnoid cyst. We present and discuss four cases with different morphological and clinical forms of the Dandy-Walker complex. In all four cases, diagnosis was reached by incorporation of clinical (macrocephaly, seizures) and imaging [X-ray, computed tomography (CT), magnetic resonance imaging (MRI)] data. Two patients were diagnosed with Dandy-Walker complex, one patient was diagnosed with Dandy-Walker variant in a rare association with neurofibromatosis and one patient was diagnosed with a posterior fossa arachnoid cyst associated with left-sided Claude Bernard-Horner syndrome, congenital heart disease (coarctation of the aorta, mitral stenosis) and gastroesophageal reflux. In all forms of DWC, the clinical, radiological and functional manifestations are variable and require adequate diagnostic and therapeutic measures. Ascites is the most frequent complication of cirrhosis and occurs only when the portal hypertension has already installed but ascites is caused by neoplasms, heart failure, tuberculosis, pancreatic illnesses, as well as other kind of affections. We describe the case of a 67-year-old patient, a retired person, without significant personal or familial history, nonsmoker, infrequent alcohol and coffee consumer with following chief complaints at onset: loss of appetite, weight loss, serious physical asthenia, delayed intestinal transit, diffuse abdominal pain and increase of abdominal circumference. Initially was misdiagnosed with liver cirrhosis. After discharged from our Clinic, suspicion of diagnosis was mesothelioma as well as after first thoracoscopy and pleural biopsy performed in a Clinic of Thoracic Surgery. Several pleural fragments collected by biopsy were sampled for the histopathological exam. The stainings used were Hematoxylin-Eosin (HE) and Periodic Acid-Schiff (PAS) for the mucopolysaccharides. For the immunohistochemistry was used the labeled Streptavidin-Biotin (LSAB)-Horseradish peroxidase (HRP) method, as well as the antibodies: cytokeratin (CK) cocktail (AE1/AE3), vimentin, calretinin, CK7, CK5/6, CK20, epithelial specific antigen/epithelial cell adhesion molecule (Ep-CAM) (BerEP4), thyroid transcription factor-1 (TTF-1), E-cadherin, CDX2, carcino-embryonic antigen (CEA) and the Hector Battifora mesothelial antigen-1 (HBME-1). The aspect at immunohistochemistry establishes a positive diagnostic of poorly differentiated mucinous pulmonary adenocarcinoma, with signet ring cells. The rapid and accurate determination of the diagnostics will allow not only for a decrease in the expenses for inefficient treatments, but also for the guidance of the patients towards clinics or centers able to provide and supervise these treatments. Monoclonal gammopathy with renal significance (MGRS) is a relative new-described entity, diagnosed especially in older patients and deriving from the group with monoclonal gammopathy of undetermined significance (MGUS). Various renal lesions may arise in MGRS, according to the ultrastructural characteristics of the monoclonal immunoglobulin deposition in the kidney, from proliferative glomerulopathies and amyloidosis to light chain proximal tubulopathy and crystal-storing histiocytosis. Although both are considered premalign or non-malignant hematological conditions, kidney involvement in MGRS aggravates the prognosis of the patients and need to be treated aggressively. We discuss the case of a 44-year-old female patient admitted in our Department of Nephrology for clinical picture of impure nephrotic syndrome and decreased renal function associated with Bence-Jones proteinuria. Renal biopsy was performed, and fibrillar amyloid deposits were demonstrated both in glomerular and tubular basement membranes; the immunofluorescence identified the presence of kappa chains. Bone marrow aspiration and biopsy showed <10% plasmocytic proliferation confirming the diagnosis of MGRS. Background: Esophageal atresia (EA) is the most frequent and severe congenital anomaly of the esophagus, occurring in 1:2500-1:4500 live births. Five types of EA have been described, EA with tracheoesophageal fistula (TEF) being the most frequent. Aim: The aim of this paper is to evaluate epidemiological aspects, malformative associations, and prenatal diagnosis in an unusual case series of EA with distal TEF. Case presentations: The authors are analyzing a series of seven cases of EA with distal TEF. The seven cases of EA with TEF presented occurred during a period of two years, resulting in an unusually increased rate - 1.1:1000 live births. Except a late suspicion of EA (one day before delivery), EA was not diagnosed during prenatal scans despite association with polyhydramnios in two cases and single umbilical artery in four cases. None of the two cases of unilateral renal agenesis or anorectal malformations were diagnosed on prenatal ultrasound scans. In two of the cases, EA was part of VACTERL (vertebral defects, anorectal malformations, heart defects, EA with or without TEF, renal anomalies/dysplasia, and limb defects) association. Despite lack of prenatal diagnosis, postnatal diagnosis of EA was suspected at birth in four cases, at two hours in one case. Conclusions: An increased index of suspicion for congenital structural defects, particularly for EA, should be maintained in the presence of a single umbilical artery and/or polyhydramnios on prenatal ultrasound scan. Prenatal diagnosis of EA offers the chance for parental counseling, planned birth and transfer for corrective surgery and decreases the risk for postnatal aspiration pneumonia associated with early feedings. The extranodal malignant lymphomas occur mainly in the region of the head and neck, after the gastrointestinal tract. The most common site of the head and neck lymphoma is at the lymphatics ring of Waldeyer, followed by the nasosinusal region. Localization at the base of the tongue is extremely rare. The authors reported a case of a 50-year-old male with a non-Hodgkin s lymphoma, which developed at the base of tongue. An unusual sensation described as a foreign body at the hypopharyngeal region associated with progressive dysphagia were the main symptoms for which the patient was referred to our Hospital. The fibroscopic exam has revealed an oval tumor of the base of tongue, with large dimensions, sessile emergent base and smooth superficial mucosa. The tumor was removed using an endoscopic transoral approach, followed by the histopathological and immunohistochemical examination, which have been suggestive for non-Hodgkin s lymphoma with small B-cells. The treatment continued with chemotherapy, while radiotherapy was not necessary due to the fact that the tumor was completely removed. To effectively clean and shape the mandibular permanent first molars it is mandatory to understand in detail their complex internal anatomy. The middle mesial canal is an additional canal located between the usual mesiobuccal and mesiolingual canals in the mesial root of mandibular first molars. The incidence of the middle mesial canal, its relationship with main canals of the mesial root and the possibility for it to be negotiated is an important practical issue in endodontics. To identify the presence of this canal is mandatory. Accordingly, a modified endodontic access, the use of the operating microscope and periapical radiographs in two different horizontal projections are indicated to enhance the long-term favorable outcome of the endodontic treatment. Pancreatic cancer represents one of the most aggressive types of cancer, resulting in a late diagnosis and rapid death (poor overall survival). After adenocarcinoma (counting almost 80% of cases of pancreatic cancer), the second category, as frequency, is represented by the family of gastroenteropancreatic neuroendocrine tumors (GEP-NETs). Pancreatic cancer is characterized by genetic heterogeneity and may results in different evolution among metastases, which may acquire driver mutations with the ability to transform under the action of several cancer treatments. Here we report a case of a 64-year-old patient diagnosed with pancreatic tumor localized on the body and tail, invasive in the splenic and portal vein, pT3pN0M0 (adenocarcinoma pancreatic cancer), treated with a multimodal approach: surgery (splenectomy and distal pancreatectomy, with suture of the portal vein), chemotherapy, in 2010, that relapsed in 2015, with local recurrence that was resected and distant liver metastases. Immunohistochemistry of the recurrence tumor showed a neuroendocrine transformation of the tumor, with major implications in treatment and prognosis. Computed tomography examination, as well as histopathological and immunohistochemically testing, sustained positive and differential diagnosis. Nephrotic syndrome (NS) is a rare complication of hematopoietic cell transplantation (HCT) and is thought to represent a renal manifestation of chronic graft-versus-host disease (cGVHD). Glomerulopathies occur less often in recipients of autologous as compared to allogeneic HCT and, in this setting, renal pathology is less well characterized. This case report describes a 54-year-old man admitted for the evaluation of a nephrotic-range proteinuria. His past medical history included a lambda light-chain secreting multiple myeloma (MM) for which he underwent autologous HCT. Prior to admission, the level of proteinuria on successive check-ups was over 3.5 g/day, while on treatment with Losartan for the past six months for mild arterial hypertension. At the time of admission, the clinical examination was unremarkable and there were not any signs of cGVHD. Initial testing showed a nephrotic-range proteinuria (5.6 g/day) with normal renal function, while excluding secondary causes of NS. The patient underwent a kidney biopsy that revealed the classic variant of focal and segmental glomerulosclerosis (FSGS). The patient was started on Cyclosporine 5 mg/kg/day and, after nine months, he experienced a partial remission (proteinuria 1.2 g/day). This is the first report of FSGS as the etiology of autologous HCT-associated NS. In childhood, the most common type of brain tumors is medulloblastoma, a highly malignant primary brain tumor that is found in the cerebellum or posterior fossa. The tumor mass increases and generates obstructive hydrocephalus. Risk factors (that might be involved in some cases) include the genetic syndrome such as type 1 neurofibromatosis, exposure to ionizing radiation and Epstein-Barr virus. Medulloblastoma is associated with recessively inherited Turcot disease and with conditions as ataxia-telangiectasia syndrome in several cases. The authors presented two cases of female patients (aged one year and eight months old, respectively 4-year-old), both of them with weight deficiency, with personal history of head trauma. First case, M.D.M., was admitted in Emergency Room of the Emergency County Hospital, Craiova, Romania, for symptoms that included headaches, impaired vision, vomiting, mental disorders, ataxia and body imbalance. The reason for refer to the Surgical Unit care was posterior fossa tumor diagnosed by computed tomography (CT) scan. The second case, V.F., a 4-year-old girl, was admitted to First Pediatrics Clinic of the same Hospital, on October 2014, for seizures, early morning vomiting, loss of appetite, inability to walk and stand and also, mental delay. She had cafe au lait spots on her trunk, suggesting type 1 neurofibromatosis. A brain CT scan revealed a tumor being developed in the fourth ventricle (in the vermis of the cerebellum). Both the girls underwent curative surgery in different Clinics from Bucharest. The two girls with the same diagnosis showed contrasting post-surgical evolution: M.D.M. still survives, while V.F. survived only for six months following first surgical intervention. The first patient, M.D.M., received chemotherapy before and after the surgery, which a slow but favorable recovery noted. For the second patient, the brain CT scan performed four months after surgery showed multiple masses in the cerebral posterior fossa, suggestive of leptomeningeal metastases, but without local recurrence of the medulloblastoma. The patient started chemotherapy and, after two sessions, she went for second surgical treatment. Six months after the second surgery, the second female patient, V.F., died. The objective of this study is to find the reasons of their different clinical evolution. The authors emphasized the clinical similarities of the patients, both being female, having similar symptoms and incidental medical events (upper and lower respiratory tract infections and head trauma) but most important, they stressed out the factors which contributed to the different clinical outcome, the second patient having a more aggressive form of medulloblastoma and receiving chemotherapy only after leptomeningeal metastases were evidenced. In addition, as for the second patient, she might had clinical criteria for type 1 neurofibromatosis (the author specified the number of the cafe au lait spots being over 6, like her brother, mental delay, without other clinical signs), which might have contributed to the poor outcome. The etiology of medulloblastoma can also be involved with chromosome 17 and the diagnosis of such a brain tumor can be an evolutive criterion for neurofibromatosis. The diagnosis can provided only by genetic tests. There is a vital risk and a reason for the lethal evolution of V.F. patient. As medulloblastoma is a very aggressive malignant tumor, the approximate cumulative survival rate for preschool age group having a histological follow-up was found to be 47% over a span of five years of rigorous treatment. Celiac disease (CD) has been associated with several genetic and immune disorders, but association between CD and hereditary fructose intolerance (HFI) is extremely rare. HFI is an autosomal recessive disease caused by catalytic deficiency of aldolase B (fructose-1,6-bisphosphate aldolase). We report the case of a 5-year-old boy suffering from CD, admitted with an initial diagnosis of Reye s-like syndrome. He presented with episodic unconsciousness, seizures, hypoglycemia, hepatomegaly and abnormal liver function. The patient has been on an exclusion diet for three years, but he still had symptoms: stunting, hepatomegaly, high transaminases, but tissue transglutaminase antibodies were negative. Liver biopsy showed hepatic steatosis and mitochondrial damage. The dietary history showed an aversion to fruits, vegetables and sweet-tasting foods. The fructose tolerance test was positive, revealing the diagnostic of hereditary fructose intolerance. Appropriate dietary management and precautions were recommended. The patient has been symptom-free and exhibited normal growth and development until 10 years of age. Macrodystrophia lipomatosa is a rare, congenital, non-hereditary disease, characterized by local gigantism of the fingers or toes. We report the case of a 37-month-old boy, with no prior past medical history, who presented with a gigantic dystrophy of the left forefoot. The location of the deformity was involving the plantar and dorsal aspect of the foot, and digits 1 to 4. After clinical examination, imaging study assessment, and differential diagnosis considerations, it was established that macrodystrophia lipomatosa was the cause of the deformity. A reconstructive surgical intervention was planned. The hypertrophied tissues were excised, resulting in a reduction in the forefoot s volume. The patient had a favorable postoperative course and ambulation was allowed with a custom-made shoe. The case represents a rare pathological entity with complex diagnostic and therapeutic considerations. As far as treatment options, the surgeon must decide between a reconstructive surgical intervention and amputation. Purpose: The study proposes an analysis of the ethical aspects that occur in communicating bad news following histopathology laboratory tests in medical practice, in particular in the case of the anatomical pathology diagnosis confirming a medical condition of poor prognosis. Background: Over the last decades, the progress of science and technology in the medical field, as well as the explosive increase of specialist information available on the Internet have led to unprecedented ethical issues related to the communication modality of histopathology test results to patients. Content: The paper analyses from an ethical and legislative perspective the main ethical dilemmas that occur when choosing a modality for communicating test results. Discussion and Conclusions: While communicating bad news is an essential ability for medical professionals, it should be used within the context of observing the patients right to decide whether they wish to receive such information or not and their right to their own autonomy, by means of a personalized protocol for communicating bad news in current medical practice.